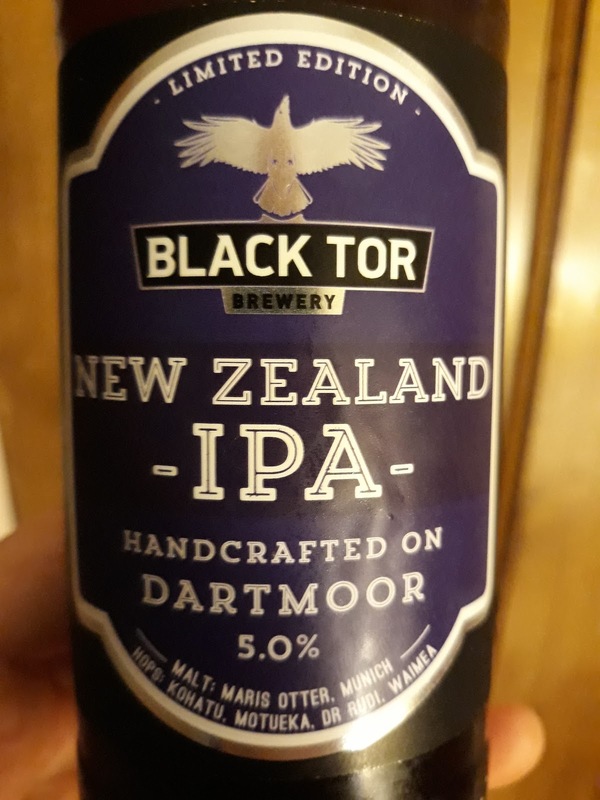 When some friends from New Zealand visited they were bemused find a New Zealand IPA in Dartmoor. Particularly as it was made in Dartmoor. I had to explain that in the world of beer the name of a country is often used as a flavour descriptor, not a statement about where the beer is made. "American" means made with citrussy hops, "Belgian" with phenolic yeast, and in the case of "New Zealand" it's the hop flavour again. It hadn't occurred to me until I saw their confusion that this might be considered slightly odd. Really the word "style" should be included to remove any ambiguity. It also got me thinking to how many others there are. "English" means traditional English hops, but "New England" means hazy and fruity, and "Russian" is a term applied to stouts to say they're strong. Different American coasts are used to denote different types of "American" IPAs. Does German/Czech get used to describe different styles of pale lager? Can't say I've really noticed it. That "farmhouse" is now used to indicate the type of flavour you'll find in a beer that's highly unlikely to have ever been anywhere near a farmhouse is also a bit strange. As is "wild" used to describe beers made with non-standard yeasts (and possibly bacteria) that may well have been cultured in a laboratory. I'm sure there are more out there. Anyway, the beer was nice. Cheers Aub and Ruth! It's colder inside, a welcome escape from the blistering heat. Away from the blazing sun it's dark until your eyes adjust, revealing rows of wooden barrels stretching into the gloom where microorganisms get to work on the wild beer. The damp, dank cold makes the building feel like a cellar, not a warehouse. A musty smell pervades the atmosphere, invoking thoughts of moist earth, mushroom compost and slowly maturing beer. Brewed on modern plant just across the yard the beer takes on a primitive, more elemental character in the barrel store. The careful controls of the brewhouse are abandoned for the primitive world of yeast and bacteria which slowly transmute the wort into wild beer. That's it, I can't manage any more. I'm not up to this. When I visited Wild Beer brewery I bumped into beer writer Adrian Tierney-Jones and talked about beer and beer writing as we avoided the England world cup match. At the moment he's focussing on capturing 'moments' so I thought I have a go at the moment of entering the barrel store, but I'm really not cut out for it. He can do gloriously paragraph break free streams of consciousnesses but for me it's like getting blood out of a stone, and after several hours I'm left with a modest amount of words that wouldn't look out of place as a single paragraph. Certainly not an impressively intimidating block of text that would be difficult to follow. This beer writing isn't easy. Wild Beer were having an open day/beer festival thing and thanks to the Guild of Beer Writers I'd got free entry and ten pounds worth of beer tokens. Which didn't go very far, but that's just as well as I was driving. They're in the process of building a bigger brewery but currently are brewing three times a day on 30hl kit. We had an excellent tour from a very knowledgeable brewer. They have onsite bottling and canning. The canning equipment is a bit newer so actually has less oxygen pick up than with the bottling. They also do beer in cask and keg. 'Clean' and 'wild' beers are currently produced on the same site, though they did have different colour coded hoses to help with avoiding cross contamination. It must be fun getting to make such a diverse range of beers. There was an impressive selection of (slightly) sour beers available and a mushroom one called 'Breakfast of Champignons' which should surely win an award for the name. Certainly the wild beers were the stars of the show, though I can't help but suspect that the clean ones help keep sales high. It will be interesting to see where they do with the new brewery. Once more we've been treated to someone with a vested interest saying cask beer should cost more. It may be because I spend too much time on the internet but nothing in the article seemed new. It goes through the usual craftie critique of cask beer and comes to the usual conclusion: it should be more like craft keg beer. Or bottle or can, the author doesn't attempt to define "craft beer" in any way, but I think it's safe to assume cask beer is excluded. As is often the case in beer writing opinion is dressed up as analysis, with the dubious use of a statistic or two to give a fig leaf of credibility. Which is exactly what I'm going to do now. "in 2016 cask shrunk by 3.8%, while the craft beer sector as a whole grew by 18.8%. Even more damning is the fact that cask has shrunk by 5% over the last six years." But we're not told that keg beer sales have declined 25% over the last six years, a strange oversight as the figure comes from the same article. The death of keg is coming far faster than the death of cask. And as mentioned previously the "craft beer" is not defined at all, or the format in which it is sold. Overall beer sales in Britain have been in decline for many years, and the proportion of draught beer sold has also been falling. Back when cask beer was showing modest growth, it was pointed out that it was in effect "defying gravity" as with massive numbers of pubs closing the amount of places in which it was sold were falling. Unlike undefined "craft beer" cask beer is almost only sold in pubs, so pub closures are inevitably going to hurt cask beer sales. Pub closures though, or the shift from draught to small pack beer, aren't mentioned at all in the article, a huge omission. We then get on to the fact that cask beer is sold for less than keg beer. I've always been of the opinion that this is proof that god loves us and wants us to be happy, but on a more mundane level when keg beer was introduced it was sold as a premium product compared to "normal" cask beer and was sold for a higher price. Keg beer has always cost more than cask and it's nothing to do with CAMRA, though the author does take a swipe at CAMRA discounts, something that are only offered voluntarily by pubs because it makes business sense to them. Next comes the pernicious argument popular with crafties that more expensive beer is better beer, and he waxes lyrical about a delicious, but expensive to make, pint of Cloudwater cask beer. The best pint I ever had was also cask beer, but it was made in a giant beer factory in Burton so I doubt it had huge production costs. What with cask being cheaper than keg beer is unusual in that price and quality are not linked, and it's possible to drink world class beers for less than inferior global brands. "If CAMRA is serious about cask growth, it has to make the market sustainable for the innovators who will bring it to a new generation. Either the price of cask goes up, or beer duty has to go down." "Of course, if the price of cask beer were to rise, the quality would have to as well"
Which is nice, though no mechanism is given for how this will come about. We're told "many reputable writers" have said finding well kept cask beer is increasingly difficult, though that quote only links to a single writer and my own experience is certainly different from his. Then it's back to CAMRA who we're told should invest in a hare brained scheme to provide training and equipment for pubs, making the common mistake of confusing a consumer organisation for an industry body. After that it's the tired old line that CAMRA aren't interested in quality, including a swipe at their own beer festivals, ignoring the fact that they've invested heavily in beer cooling equipment. With incredible insight it's revealed that the Great British Beer Festival is mainly a cask beer festival, and rare foreign beer sell out fastest. Then it gets to CAMRA needs to embrace keg to save cask. Or cask should be more like keg. Or more craft or something. That the 2018 ratebeer second best brewery in the world abandoned cask is a huge blow to its reputation apparently. Will cask beer be able to recover from such a mortal wound? Did anyone else even notice? We're also informed that CAMRA need to highlight beers made by breweries often found at their festivals (yes, bit of an odd one that). I do get cynical when I see brewers and distributors saying cask beer should cost more. Personally I'd rather seem beer be made freely available and distributed on the basis of need. I will of course need a lot! At least in his post the author didn't include the awful statement that "beer is a luxury item" but as you may have guessed I wasn't overly impressed with the article.